U.S. EPA today is taking a first step toward potentially replacing the Obama administration's signature climate rule. The agency released a notice asking the public for comment on what a replacement rule for Obama's Clean Power Plan should look like. "EPA is considering proposing emission guidelines to limit greenhouse gas (GHG) emissions from existing electric utility generating units (EGUs) and is soliciting information on the proper respective roles of the state and federal governments in that process, as well as information on systems of emission reduction that are applicable at or to an existing EGU, information on compliance measures, and information on state planning requirements under the Clean Air Act (CAA)," says the notice released by EPA, known as an advance notice of proposed rulemaking. The Trump administration has signaled that if it replaces the Clean Power Plan, it would do so with a much narrower rule aimed at boosting the efficiency of specific plants, instead of the broader approach taken by the Obama administration. Separately, EPA has proposed repealing the Clean Power Plan, which sought to cut power plants' greenhouse gas emissions 32 percent below 2005 levels by 2030. "Consistent with our commitment to the rule of law, we've already set in motion an assessment of the previous administration's questionable legal basis in our proposed repeal of the Clean Power Plan. With a clean slate, we can now move forward to provide regulatory certainty," EPA Administrator Scott Pruitt said today in a statement. 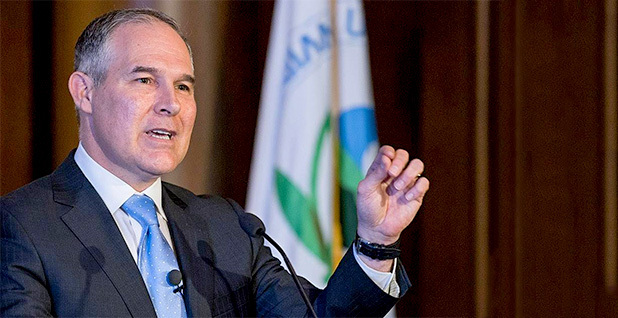 "Today's move ensures adequate and early opportunity for public comment from all stakeholders about next steps the Agency might take to limit greenhouse gases from stationary sources, in a way that properly stays within the law, and the bounds of the authority provided to EPA by Congress," Pruitt added. Click here to read EPA's notice.